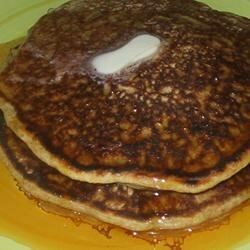 "These healthy pancakes with a hint of almond are delicious. They're thick and fluffy and they really stick to your ribs. Serve warm with maple syrup or peach jam. Leftovers are great served cold with a little peach jam spread on them, yum!" Preheat griddle to 350 degrees F (175 degrees C). In a large mixing bowl combine dry ingredients. In another large mixing bowl combine eggs, oil and almond extract; whisk until combined. Stir in soy milk. Add wet ingredients to dry ingredients and whisk until combined. Batter should be slightly thick, adjust liquid if necessary. Pour batter by the 1/4 cup full onto hot griddle. Cook until edges look dry and bubbles burst. Flip and cook another minute or so until golden brown. Serve warm. These pancakes are very heavy. They fill you up fast & taste o.k. but they are a little too heavy for me. Great!!! Wow, a receipe that I can use that soy milk!!! I just love this receipe I can use that soy milk that my husband bought me (under protest)!!! It is delicious, & I can make this one!! !